Humility: Starting at the Executive Team level and throughout the organization we have a confident but humble team. This is in stark contrast to the arrogance found in some organizations and is the foundation of much of our success. Our people are excited to hear new ideas and to collaborate. They do not believe they know everything. Learning Culture: Again, beginning with the Executive team, our people are open to and excited about new ideas. We’ve seen team members at the supervisor level being very proactive in their professional development, requesting support and coaching or looking for book suggestions from our professional Organizational Development Coach and company library to help them become better leaders. Growth Culture: Alfred people have experienced extreme growth in size and production over the past few years. In the past 4 years, the team has taken on the additional goals and made extraordinary progress in moving from tribal to formal knowledge, from a reactive to a pro-active mentality and to develop a culture of Appreciation & Accountability. Most organizations could not hold true to such ambitious goals while also experiencing yet another growth spurt with a major customer. These goals were embraced by key people throughout the organization and the teams, including the production lines, have been asked to change and grow and they have responded positively and made huge strides. Strong Workforce: We provide a strong benefits package and we share profit, even with our temporary employees. This is in part a moral obligation of providing good jobs within our community but also very strategic. At some point the labor market will shrink again. Because of the way Alfred shows appreciation to employees we will be in a good position to both recruit and retain good people regardless of changes in the labor market…a key to providing quality products and service to our customers.  Loyalty: We have multiple employees that have worked at Alfred for 50+ years. We have major customers who have been with us for up to 30+ years from their inception. We are loyal to our people and they, both customers and employees, are loyal to us. That we inspire this loyalty is indicative of the kind of business we are to work for and the type of supplier we are to work with. 4th Generation Focus: Our owner is a 3rd generation owner who continues to build and invest profits into this company with a focus on providing his own children the same opportunity he was given (provided they are capable, willing and interested.) Our long history within a single family and this 4th generation focus helps guide our customer interactions. We don’t focus on today’s dollar but rather long term stability, growth and profit. This allows us to be nimble and adaptive with new partners. Shared Services Model: Ours is a scalable, flexible, efficient structure where IT, HR, Risk Management and Financial Services are a team built of high level people who serve more than one entity. This model allows multiple entities to share the cost of such a team, getting better, higher level services while controlling costs. We recently added a Training Manager to help capture and leverage our internal knowledge and the external training opportunities as well. This type of service would not be cost-effective in most organizations and is a good example of leveraging dollars strategically through the shared services model. Manufacturing Campus: With Stamping, Machining, Plastic Injection Molding, Assembly, Supply Chain Management, Fulfillment and Distribution on a single campus, we can offer customers a turn-key manufacturing solution. Our commitment to a diversified offering is a key part of our structure. Ongoing Improvement of Internal Expertise through Hiring: We have great people with extraordinary experience and expertise on staff. Additionally, over the past 18 months we have also been strategic in our hiring of high level people. We’ve looked not just for great people but also for great expertise. We’ve brought in a number of individuals with impressive backgrounds who are currently using that expertise to make our whole organization better. (Something our entire team values and welcomes.) We will keep this strategy in place for future hires as well. All Growth is Not Good Growth: As a company, we believe in growing strategically, with the right type of customers and the right type of products. Organic Growth & Open to Potential Acquisition Opportunities: While we are focused on organic growth opportunities, we are also positioned for and interested in potential acquisition opportunities. Complex (Not Just Commodity) Manufacturing: One of our specialties is making products composed of unique engineered materials produced to extreme quality standards. This, combined with our diversified campus, makes us a unique vendor able to provide a wide range of high level, high value services to our customers. Scalable: Key to our growth strategy is to build a scalable infrastructure and model of services for both our own benefit and as a resource for our customers. We have the flexibility and expertise to be a turn-key resource to solve a wide range of problems and to likewise manage a wide range of processes and services on both the manufacturing/assembly and administrative side.